STScI-2003-15 - What can you learn from looking into the depths of space? 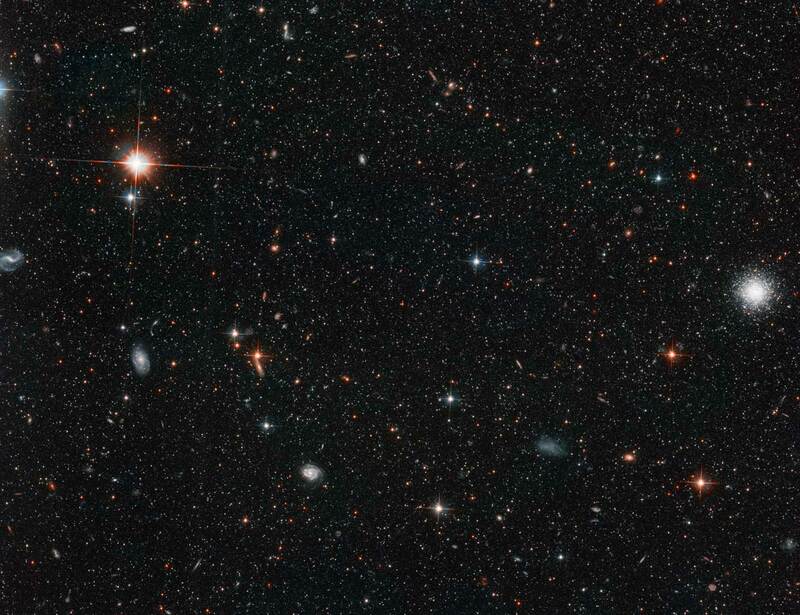 In an effort to find out true ages of stars in neighboring Andromeda galaxy's halo, astronomers stared into the galaxy giant with the new Advanced Camera for Surveys through the Hubble Space Telescope. The resulting exposure of over three days, shown above, is the deepest exposure in visible light ever taken, although shorter in duration than the multi-wavelength effort toward the Hubble Deep Field. The final image illuminated not only Andromeda (M31) but the distant universe. Andromeda's halo stars turned out to be have a wider range of ages than our Milky Way's halo stars, likely indicating more encounters with small neighboring galaxies. 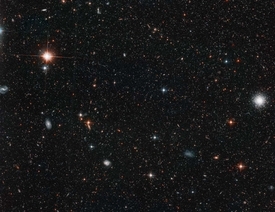 Visible on the above left is one of Andromeda's globular star clusters, while literally thousands of background galaxies are seen in the distance universe, far beyond M31. Relying on the deepest visible-light images ever taken in space, astronomers using NASA's Hubble Space Telescope (HST) have reliably measured the age of the spherical halo of stars surrounding the neighboring Andromeda galaxy (M31). To their surprise, they have discovered that approximately one-third of the stars in Andromeda's halo formed only 6 to 8 billion years ago. That's a far cry from the 11-to-13 billion-year age of the stars in the Milky Way's halo. Why the difference in halo ages? You might call it a tale of rich galaxy/poor galaxy. Apparently, M31 must have gone through a major "corporate merger" with another large galaxy, or a series of mergers with smaller galaxies, billions of years ago. Astronomers cannot yet tell whether this was one tumultuous event or a more continual acquisition of smaller galaxies. The newly discovered younger stars in Andromeda's halo are richer in heavier elements than the stars in our Milky Way's halo, or in most of the small dwarf galaxies that surround the Milky Way. Indeed the level of chemical enrichment seen in these younger stars is characteristic of relatively massive galaxies, containing at least a billion stars.